When I read Noel Nadesan’s short novel, I had the opportunity to revisit my recollections of the past, in particular, of the late 1970s and early 1980s. It was the period of transformation of the Sri Lankan Tamil people’s struggle to gain equal rights and opportunities, from a peaceful form to violence. During the colonial days, introduction of missionary education in the north brought opportunities to some students. Later on, even some of the Sinhala students in the south took advantage of this situation to become civil servants and powerful politicians. In a similar manner, educational institutions in the south provided opportunities for some students. Tamil, Muslim and other students also took advantage of this situation. Memories of the early 1950s remind us of the times we had with friends of diverse backgrounds, enjoying together in moments of happiness and helping each other in moments of sorrow. In my primary school days, I had several Tamil and Muslim school friends. The novel helped me vividly recollect the sporadic violent events of the 1950s and 60s, which may have probably led to the development of my current ethno-political thought processes. It brings back the memories, which, at times, are still sweet but at times, extremely bitter. The comment in the novel that Jaffna’s main export had been human resources leads us to an interesting and vital question. Why a country like Sri Lanka with a comparatively high literacy rate, a source of human resources, cannot become a knowledge exporter in this era of knowledge economy? What are the barriers that prevented us achieving such a goal? In my opinion, one important factor is that Sri Lanka, in the name of defending great Sinhala Buddhist civilization, linguistically isolated itself by drastically limiting and weakening the provision of English education to its people. Another factor is that while at the economic level Sri Lanka was willing to embrace capitalism in all its manifestations, at social and cultural level, it endeavoured to retain many of its semi-feudal vestiges. There are positive and negative aspects in every society, in every community and in every person. Some have been able to enjoy opportunities because of their exceptional circumstances, efforts and skills, while some others enjoy even better opportunities due to their privileged socio-economic and/or political status. Some gain their positions due to merit while some do so at the expense of others using ulterior means and methods. The latter mostly brought and still brings peril to the community and society. The Rising tide of nationalism against the injustices of colonialism and its socio-administrative paraphernalia was not only limited to Sinhala people. Tamil youth of Jaffna were the first to publicly protest against colonialism. For instance, the Jaffna Youth Congress boycotted the Donoughmore Constitution of 1931 for the reason that it did not offer Poorna Swaraj (complete independence). However, as was clearly visible since the 1940s, sectarian, one-sided and power hungry politicians never endeavoured to work towards building a Lankan (Ceylonese or Sri Lankan) nationhood. They continued to harness the differences among the socio-economic and ethnic diversity of Sri Lankan peoples, aroused and used each nationalism against each other, to protect their own self-interests and privileges. 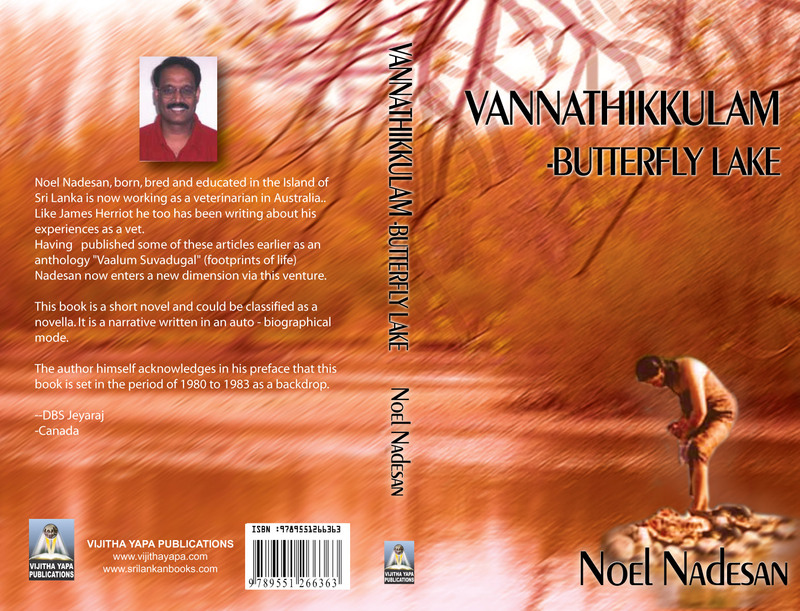 This novel indicates how, politicians of all hues and cries jumped onto the bandwagon by pushing people along the path of extreme nationalism, to take advantage of Sri Lanka’s history and civilization in order to make a mockery of it. When tensions erupted, the only response successive governments and governing political parties knew was employing violent suppression. In the long term, this situation made the youth of the south and the north to see no other alternative but resort to weapons and violence. Of course, those youth were inexperienced and immature but all the allegations and accusations against them neither indemnify the governments and its politico-security arms, nor justify, extenuate nor mitigate the heinous activities carried out against the youth. Rulers suppressed the views of their opponents and they in turn commenced suppressing the voices of their political opponents and of those within their own ranks. This has been a common phenomenon across the island, both in the south and the north. The novel brings us home how the freedoms enjoyed by the peoples were being gradually curbed in this process. Thus, the history of Sri Lanka became stained with blood spilled in the name of civilization. The novel depicts the harmful aspects of ugly rumours and then the confessions of those who believed in those rumours. A good example is the story behind the golden tooth. Rumours floated in 1958 that Sinhalese had been murdered in Jaffna and Medawachchiya and that Tamils were on their way to kill more Sinhalese in Padaviya. The security forces played a more positive role at that time by preventing a large-scale confrontation. I remember such rumours being floated in 1983 to the effect that Tamils were coming en masse to attack Colombo. However, the violence in 1983 was entirely different, because at least part of the security forces played a major role in the black July events intensifying violence and abetting escalation of events. The pogrom of 1983 that was initiated in Colombo was made to spread to Greater Colombo and then to Kandy, Matale, Nawalapitiya, Badulla and Nuwara Eliya. The then President of Sri Lanka justified the attacks against Tamils, and the carnage spread out further. The government had connived in large-scale violence against a section of its own people. This pogrom transformed the situation entirely, making violence and terror an ongoing phenomenon in the island. No doubt, Tamil people also would have been the object of many exaggerations to the effect that many thousands of Tamils have been killed in the south. Except for the occasional but odd blending up of social and cultural aspects from the author’s Sri Lankan and Australian experiences, the picture he paints of the north during the period appears very similar to the situation that existed in the south of Sri Lanka. The memoirs and analytical thoughts, though evolving out of the experiences in the north and central provinces of Sri Lanka, bear a close semblance to the experiences of socio-economic and political developments in the south. However, the situation in the North was complicated at least in one more dimension, that of harming the national dignity of a people. Destruction of places of worship and the Jaffna public Library destroyed whatever dignity was left behind among the Tamil people, after the defranchisation of plantation workers, standardization of university admissions, one-sided colonization schemes and so on. In the novel, relatives and friends of Dr Sooriyan warn him of the consequences of marrying a Sinhala girl and living in the north among Tamils, reflecting the general racist attitudes that have existed among ordinary Tamils. An example is that Sooriyan’s relative, a café owner, listening to the event of the registration of his marriage to Chitra “as if listening to a condolence message”. At the same time, it is a reminiscence of similar racist attitudes that have existed among ordinary Sinhalese against marrying Tamil girls and living in the South among ordinary Sinhalese. In a similar vein, contradicting this aspect of racism, one can observe many features of Sinhalese and Tamils acting as kind and caring human beings. This has been my personal experience since 1950s. Sooriyan’s mother hugging and kissing Chitra when she met her in Jaffna, shows the love of a mother penetrating beyond ethnic identities and boundaries. Another example is when Tamil individuals were subject to threat and intimidation by Sinhala mobs, some Sinhalese coming forward to defend Tamils irrespective of their Tamil identity. The incidents in Mars Hall at Peradeniya Campus during racial riots of 1977, where Sinhala students were protecting Tamil students from hooligans while elsewhere, Tamils were being murdered or forced to flee or live in refugee camps, is a typical example. As the author comments, these Sinhala students deemed other students “as friends and not as Tamils”. At least some Sinhala students believed that all Tamils known to them “were good souls” while those unknown to them “were bad”. Mrs.Wijesinghe is another example where she handed over a gun and a torch to Sooriyan and his friend, when an attack on them was apparent imminent but of whom the Wijesinghe family did not know anything much. I am sure Tamils in the North and East would have acted similarly, in protecting Sinhalese if they had faced similar situations of attack. However, as suggested in the novel, these actions of defending the affected people do not seem to arise from a conscious thought process about the national identity of an individual, but from a general feeling of loving-kindness of a human being towards another fellow human being. Hasn’t unbiased non-fundamentalist religious upbringing played a role in depicting this type of behaviour? As far as I recollect, the JVP did not attempt to mythify King Dutugamunu’s character. However, the standard school history lesson delivered to Sinhala students in the South, without any historical justifications, had obviously mythified the king’s behaviour. Modern Sinhala nationalism had made out of his character an archetypical anti-Tamil hero. According to the novel, when Rohan Wijeweera, the founder of the JVP, recollected the history of Duttu Gemunu era, youth in the audience became violent. Furthermore, the novel depicts expressions of ferocity and extremism appearing in Rukman’s face when listening to Rohana’s speech. Despite this, elsewhere in the novel, Rukman is portrayed as a person respecting and caring for others including Tamils. Is this misunderstanding or misrepresentation? I tend to believe that this is a misunderstanding. It is apparent that Rohana made his speech in Sinhala and Sooriyan could not understand a major part of his speech. Recollection that the JVP and its leader praised former kings is more to do with praising marvelous agricultural and architectural achievements of Sri Lanka’s ancestors. I believe no one including the JVP, would like to recreate old tribal slave, feudal or Asiatic socio-economic formations. The novel also projects that members of the JVP had been prohibited from consuming liquor. I believe this also is a misunderstanding. An outsider may see such characteristics of politico-military movements, whether it is the JVP or the LTTE, as something imposed from the top. Nonetheless, from my experience, such characteristics were not imposed but were reflections of the hardships such movements underwent during their periods of formation, leaving an imprint among members the need to show their commitment and determination to achieving their cause. Leaving these details aside, the novel tries to expose the hypocritical nature of politics whether it is coming from the right or the left. The general and overwhelming impression that runs through the novel is that Tamil people dislike the governments and their security forces. Tamil people consider that security forces are used to subjugate them and to occupy their homeland. If one keeps the nationalist lens aside, even Sinhala people do not maintain a love affair with the government security forces. It is well known that consecutive governments have used its security forces and para militaries to eliminate tens of thousands of their Sinhala political opponents. In a similar manner, the militant movements, both in the south and north, have disposed many of their political opponents. It is like Newton’s third law playing a role. Nevertheless, we need to reject this violence. Because when politics of harmony do not play an active role, politics of violence will fill the ensuing gap. When peoples’ participation in political process is prevented or undermined by other means, violence becomes the means of political expression. It is unfortunate that the very people, who condemned the malpractice that took place in the first District Development Council elections in the north, seem involved during the last elections held there in stealing the ballot of its own people. The fact of the matter is that the governments or militant movements have not given the peoples of Sri Lanka, the opportunity to enjoy their fundamental human rights. At times, the novel seems to express partial suggestions leading to views that leadership takes place in a vacuum. Leadership cannot be understood without taking into consideration the context within which it takes place. It needs to be considered in specific contexts. This is not an attempt to justify bad actions of leaders but I strongly believe that leaders cannot lead without followers following them. Leaders acting alone are not responsible for bad leadership. A leader chooses a particular course of action and then encourages others to follow that course of action. The group will follow the leader. The followers also matter in this equation. References to Mao Tse Tung and “Year Zero” need consideration in this light. It is difficult to separate the leader, the follower and the context, because leadership is not something simple, driven along a straight-line sort of a process. It is complex, more than one player playing in a specific context. How could we separate Iraqi leadership of Saddam Hussein from American leadership of the oil riches and the Bush family. Are the leaders alone that are evil? These unresolved questions cannot be answered in a simple yes or no. The novel highlights the fact that until the 1960s there was no demand for separation (though some tend to twist political facts). The Government’s disregard for development, except for their own areas of influence is evident when the novel refers to Eluvaithivu, which is the smallest of the islands in Jaffna, where “The ordinary people accepted these problems as their destiny, since the Government was so far away like God.” It is not only true to Eluvatheevu but also to large areas of the mainland cutting across all its ethnicities. This important factor needs vital consideration when analyzing the post independent violence in Sri Lanka. While posing questions such as why are the Jaffna people demanding a separate state? What are the shortcomings? Where are you going to find employment in Tamil Eelam? What is the position of Tamils residing in Colombo? What is the future situation of hill- country Tamils? What is the boundary of Tamil Eelam? and Will Tigers come to Medawachchiya?, it is interesting to note the comment in the novel that Tamils residing in Colombo and the hill country were the worst affected during riots but they are destined to live among Singhalese even if separation takes place. Of course, these are difficult questions to answer since parties to the conflict have many versions of the same story, which needed sorting out by negotiations. Nevertheless, I believe there is a Tamil response to such questions as there is a Sinhala response. The novel seems to either not come up with that version or pretends to not know that version. However, while referring to colonization schemes and re-demarcation of villages the novel exposes the fact that there was an intention to break the geographical continuity of Northern and Eastern provinces and to deprive Tamils of statehood by settling Sinhalese in colonies and creating Sinhala villages in between Tamil villages. In the expatriate community, at least until recently, every Tamil was considered “a tiger”. This is nothing new. This was prevalent in the south of Sri Lanka since 1980s. Any Tamil in the south was looked at suspiciously and many innocent Tamils were publicly accused of being “Tigers”. I knew many Sinhalese who would first utter those comments and then toning it down by saying that it was just a joke. During such incidents, I have observed expressions of excruciating pain appearing in their faces. The pogrom of 1983 made the situation infinitely worse. Even after coming to Canberra, it was unfortunate to have had to listen to such comments in the workplaces where Sinhalese and Tamils had to work together. Many ardent Tamil opponents of the Tigers were also at the receiving end of such allegations. The novel comes to an end with Sooriyan and Chitra leaving Sri Lanka for good. They had mixed feelings but still very much attached to the country they were born in. Within the expatriate community the first generation of the migrated usually have extremely strong feelings about what happens in Sri Lanka. Few expatriates have become providers of assistance to one Sri Lankan party or group. The rest have become mere observers or well-wishers. At the same time, we need to accept the fact that the peoples living in Sri Lanka will have to decide their destiny. Dr Nadesan needs to be congratulated on his challenging work because as an expatriate he courageously explains why he had to leave the island. If it were the paradise we would have liked it to be, many of us would not have become expatriates today. For those who are out of touch with the situation in Sri Lanka and who cannot understand why things happened the way they happened, this short novel would help to jog their memory and bring them back to reality. No doubt, many who have come here are good people and have good intentions. If they do nothing and just remain observers, then triumph of evil will be assured. We cannot shut our eyes to the facts all the time in order to pretend that we see nothing wrong.